by Jarrod Jones. 2000 AD, the raging sci-fi comics anthology series packed with undiluted Thrill-power, has fried our circuits and expanded our expectations for over forty years. Bursting onto the British comics scene in 1977, the Galaxy’s Greatest Comic has been a haven for innovation, dauntlessly knocking out pulse-pounding stories every single week with mainstays such as Judge Dredd, Strontium Dog, Tyranny Rex, Durham Red and so many others. But perhaps the biggest badge of honor on its decorated shoulders is something that lies beyond its own galactic borders: 2000 AD has often been the launching pad for comics’ most lauded and respected creators. Run a quick list of those who cut their teeth at 2000 AD and try not to get dizzy: Alan Moore, Grant Morrison, Neil Gaiman, Garth Ennis, Steve Dillon, Peter Milligan, Frazer Irving, Alan Grant, Jock, Brian Bolland, Kevin O’Neill, Simon Bisley… we could keep going. We really could. 2000 AD remains a bastion of sequential subversion to this day. And to recognize its vital place in the industry, it has launched a new competition for aspiring new talent: 2000 AD Art Stars, a new opportunity for artists to show off their abilities to not just the discerning editorial bots over at the Galaxy’s Greatest, but to readers and, potentially, future employers. Best of all, there’s money involved! 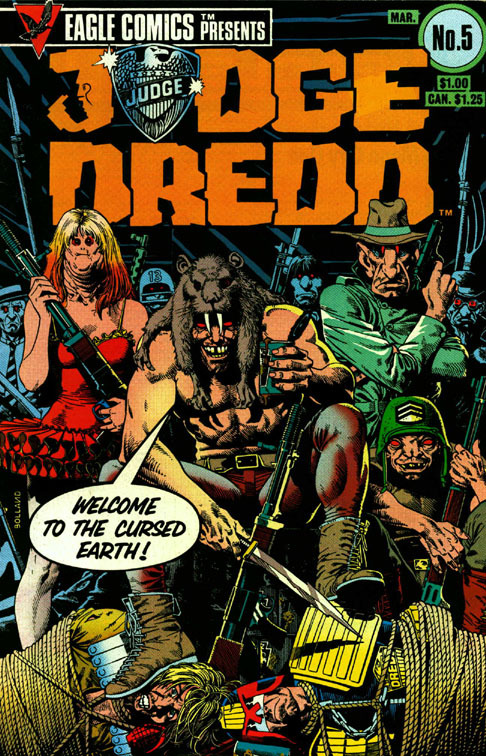 Mark’s excellent pin-up shows Judge Dredd in the clutches of Brother Morgar and the Brotherhood of Darkness from The Cursed Earth epic, as shown in one of Brian Bolland’s all-time classic covers from the Eagle Comics reprints of the 1980s. Both the execution (pun intended) and style impressed 2000 AD’s editor, Matt Smith, and now Mark’s work will be seen by the readers of the legendary weekly comic. For you future artists out there, keep your eye fixed to 2000 AD (perhaps subscribe to their Thrill-Mail?) for future Art Stars opportunities; every four months comes another chance for your work to be seen in one of the most important comics series in the universe! Splundig vur Thrigg! 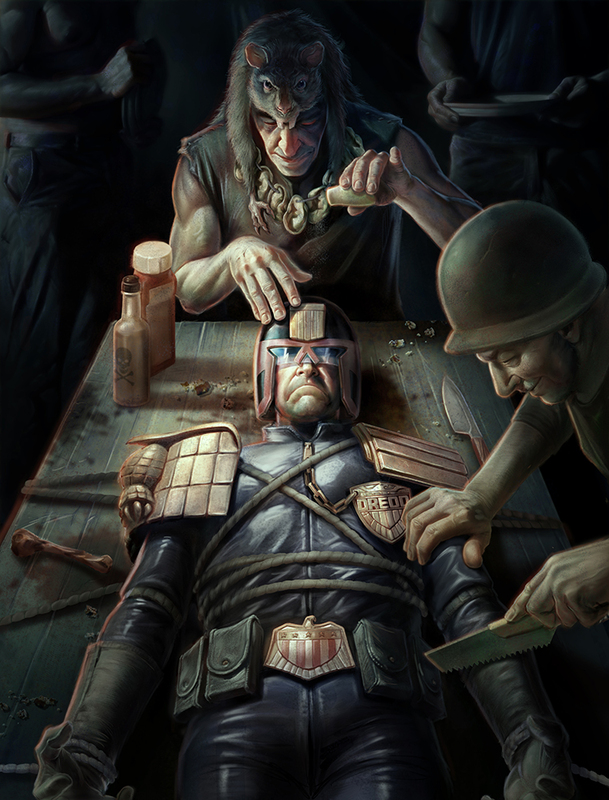 For more information on 2000 AD Art Stars, click here. From ‘2000 AD’: 2000 AD Art Stars is a chance for would-be comic book artists to get into the pages of 2000 AD AND get paid for it—every four month we announce a new theme based on a 2000 AD character or series and issue a call for artists to send us ‘Star Scan’ pin-ups. The winner, chosen by the editorial team, will be published in a future edition of 2000 AD. It’s an incredible chance for amateur artists to follow in the footsteps of some of comics’ greatest artistic talents and maybe even get their big break in the comic book industry!